GLOW opens with a dynamic and evocative introduction to the world of women’s wrestling. Set to Scandal’s “The Warrior,” the title sequence uses rotoscoped, neon imagery to visualize the distinctly feminized spectacle that the Netflix series both captures and subverts over the course of its first season. I was already anticipating the series, but the title sequence amplified my interest, setting a tremendous tone for the series that follows. And so when I immediately moved onto the second episode on Netflix’s screening site, I prepared to enjoy another trip into the glimmering dreamscape where heart to heart, we’ll win. But then I noticed something odd: The opening title sequence was gone, replaced by a title card featuring the show’s logo. I was alarmed and wondered if it was perhaps a mistake with the screeners, but when the show launched officially, I checked Netflix, and the sequence that I had been so impressed with never made a second appearance. Netflix had commissioned someone to make the perfect preface for GLOW, and they had chosen to use it once and then toss it away. As a lover of opening title sequences—a once-standard TV feature that launched a thousand theme-song earworms, and for decades acquainted viewers with a series’ cast and concept—this decision confounds me, but it’s become increasingly clear that it’s not an isolated incident. As shows like GLOW ditch this creative outlet, and the ubiquitous “Skip Intro” button invades Netflix originals and acquisitions alike, a clear message is forming: The streaming service is set on killing opening title sequences as a “service” to subscribers who are eager to consume content as efficiently as possible. This was certainly not the case when Netflix launched House Of Cards in 2013. At that time, Netflix clearly wanted its original series to carry the auspices of premium cable, and so Beau Willimon’s series was allowed to indulge in a 90-second time lapse of Washington, D.C. that set the tone for the political drama. The same went for Orange Is The New Black, where creator Jenji Kohan commissioned Regina Spektor to record an original song and used it to soundtrack a series of close-ups of real female inmates. In both length and concept, these are comparable to the opening title sequences that accompanied premium cable’s push into original programming in the 1990s and 2000s: 60- to 90-second tone poems meant to prepare the audience by previewing setting, character, theme, or any other information deemed relevant. In following HBO’s and Showtime’s lead, Netflix was helping assure the legacy of an art form that was at risk of being lost at the turn of the 21st century. While broadcast series once came with lengthy openings to help explain a show’s premise (see: The Beverly Hillbillies) or simply reintegrate the viewer into the world of a particular show (see: M*A*S*H), the demand for more commercial time in any given hour meant that broadcast shows were increasingly abandoning their title sequences. You can trace this shift in the evolution of ABC’s TGIF block: There’s a full minute’s difference between the title sequences for Full House, which debuted in 1987, and the Olsen twins’ 1998 follow-up, Two Of A Kind. The absence of advertisements on premium cable gave shows the ability to develop what became a generation of iconic title sequences—The Sopranos, Deadwood, Six Feet Under, Dexter, and most recently the ever-changing title sequence for Game Of Thrones—that have come to populate dozens of internet lists of the best TV openings of all time, along with newer examples that hark back to these traditions. It was logical that Netflix would do the same: It faces no ad restrictions and goes one step further by allowing its series to have wildly variable episode lengths. But things have changed in the past four years. GLOW wasn’t the only show this summer to showcase Netflix’s complicated relationship with the opening title sequence. Ozark, which debuted in July, carries only a generic title card and a crosshair foreshadowing its episodes’ content. Atypical has an opening title sequence in its pilot, but it’s only a shade over 20 seconds long; still it’s replaced by a title card for the rest of the season. And in the biggest shift, Netflix adjusted its interfaces to allow users to click a button to skip the intro on both its own original series and acquired series. While Netflix’s autoplay feature often does this on its own when going episode to episode, it wants to make it easier for users to skip title sequences that roll after a cold open as well. And so as I made my way through the fourth season of BoJack Horseman, the Netflix app on my PS4 kept prompting me to skip the opening titles, no matter how many times I chose not to take the offer. Despite the fact that I would 100 percent support this hyper-specific form of fascism, I want to be clear that Kenworthy is correct here. These changes are not coming because Netflix has a vendetta against opening title sequences; it’s happening because they have the data about how their users watch these shows, and so they know how many people are reaching for the remote or the mouse and fast-forwarding through title sequences. And because Netflix’s ultimate goal is to create the impression that they are creating a service personalized for each of their subscribers, they are taking steps to make the process of skipping these sequences as efficient as possible. For existing series, that means the “Skip Intro” button; for new series, that means mandating shorter sequences and limiting the use of sequences that were commissioned before what appears to be a policy change. But as someone who rarely—if ever—skips opening title sequences, for me Netflix’s decision is concerning on two levels. The first is a personal frustration with the default settings of Netflix viewing presuming a desire for the most efficient, rather than the most comprehensive, experience. While Netflix’s distribution model makes it possible to race through each new season of a show, that does not mean that’s the best way to experience that show. And yet these and other decisions are positioning such speedy bingeing as customary. 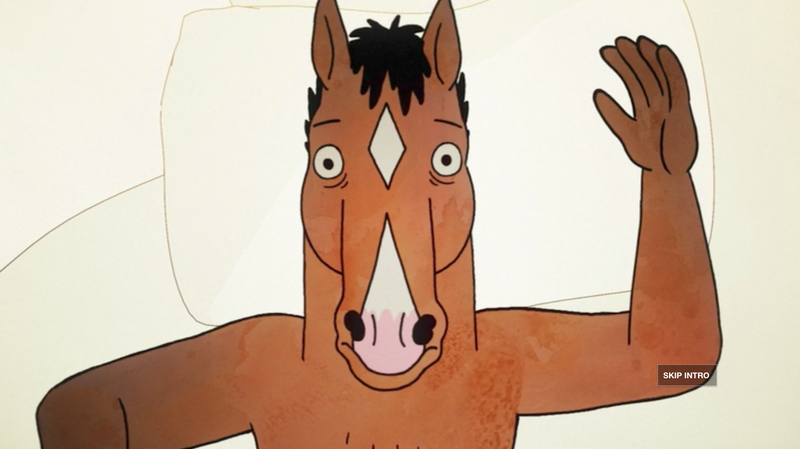 As someone who has spent three years ranting about how Netflix auto-plays to the next BoJack Horseman episode before the catchy-as-hell end credits theme by Grouplove plays in its entirety, seeing the logic that denies my sing-a-long creep into the rest of Netflix’s decision-making bodes ill for the future of the service. I acknowledge that these changes are making the platform more efficient for the average user, but they’re failing at personalizing the platform for me as a user despite (I presume) the ability to create an algorithm that could account for both forms of viewing. Does Netflix need to keep showing me the “Skip Intro” button every episode when I’ve refused it consistently? Shouldn’t it learn from my decision not to skip to the next episode immediately with certain shows and not others? My second—less selfish—concern is that we are creating an environment where producers across television will be discouraged from creating opening title sequences in the first place. One of the purposes of such sequences is to credit the actors and other crewmembers that worked on the project, and one of the consequences of creating a “Skip Intro” button is that Netflix is now making it easier for those individuals’ contributions to go unrecognized by viewers. It’s always been possible to just fast-forward through the credits on your own, but the ease of this process—which may well be adopted by Amazon, Hulu, and the streaming platforms for premium cable services like HBO, Showtime, and Starz, where title sequences still flourish—might create a chain reaction where talent push back against opening title sequences, feeling that their credits will be missed entirely by those who end up watching the show on platforms where those sequences can be easily skipped. Perhaps then the title card will become the standard, with the credits currently embedded in a title sequence instead relegated to the bottom-third of the screen, and forcibly integrated into the viewing experience. There’s a valuable creative space being lost when that happens. Whether it’s the joy in a great theme song or the evocative design of the sequence as a whole, main titles represent a space where a show can often transcend itself—see: HBO’s How To Make It In America—and deliver something of value in its own right. As much as I can support giving viewers the choice to skip over these sequences, I’m worried that Netflix’s march toward efficiency will eventually push for them to be eliminated entirely, taking away an opportunity for the show to represent itself and for the viewer to take a breath and invest in the world being presented. If GLOW’s opening title sequence had aired during every episode, it would have given viewers 50 seconds to reinvest in the time period, the music, the aesthetic, and the derring-do of the Gorgeous Ladies Of Wrestling. Netflix is arguing that title sequences are a disruption, but I’d argue they’re part of the rhythms of watching an episode of television. I value the ritual as much as Netflix believes its audience despises it. And while I’m fine with the audience choosing to feel this way, I can’t help but resent Netflix breaking into an integral part of my personal viewing experience. And I worry that the next time producers of a Netflix series come up with the idea that could become the next great opening title sequence, they’re not just going to have it skipped by audiences or dropped after the pilot. They might not be allowed to make it at all.